Megabus is having one of their '$1 bus ticket' promotions on various routes both departing from and back to Toronto. 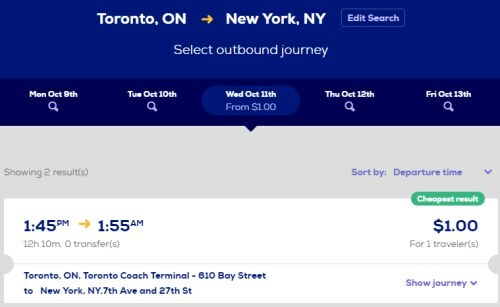 Toronto to New York City and Washington, D.C. are both currently showing tickets for $1 USD each way. There's a 50 cent booking fee, so it works out to $1.50 USD each way. 2. Select ONE WAY. This only seems to work if you search for one way tickets. Update: Actually, it may just be that the one way dates from New York City to Toronto are selling out fast. If both dates are still available for $1, searching roundtrip might work. UPDATE @ 12:23 PM EST: Checking all dates again, I'm not seeing anymore *to* Washington, D.C. either. But still seeing a few *from* Washington D.C. to Toronto. UPDATE @ 12:35 PM EST: Checking all dates again, I'm only seeing 2 dates left *to* New York City, and none *from* New York City. UPDATE @ 12:58 PM EST: A few previously sold out dates to Washington, D.C have become available again. Noted with an asterix below. Haven't seen any re-appear for NYC. UPDATE @ 4:10 PM EST: Even Philly managed to nearly sell out. A few dates left. Noted with an asterix. 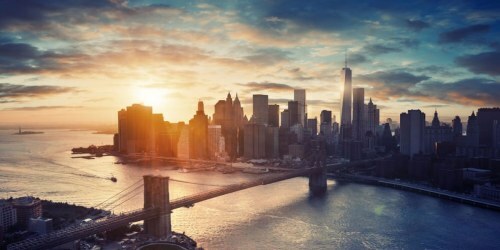 toronto, yyz, new york city, new york, united states, washington dc, north america, bus deals, megabus, philadelphia and pennsylvania.